Hayden James may have only released his first track in late June 2013, but he has amassed millions of plays for his work. Producing immense summer house jams with soulful and evocative vocals, his music has stockpiled consistently rave reviews from the US, Europe and Australia alike, being labelled the “face of the new Australian production music scene”. His first single “Permission to Love” garnered worldwide love and attention hitting #1 most blogged on Hype Machine. His debut EP out on tastemaker label Future Classic garnered much love worldwide, but didn’t prepare the indie label for the success Hayden would have with hit single "Something About You", released early 2015 on the label’s yearly compilation album and now counting over 50 million streams and a Gold certification in Australia. 2018 has now seen the release of “Just Friends” featuring singer Boy Matthews, which has enjoyed chart positioning on both ARIA and Spotify since its release and shows no signs of slowing down, already becoming one of his quickest-streaming songs ever hitting 25 million streams in 5 months. Layered with addictive drum patterns and a smooth house bassline, “Better Together” is yet another infectious tune from the powerhouse producer. 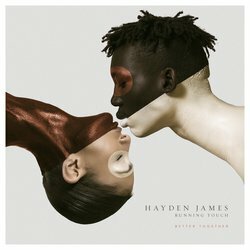 Featuring vocal stylings from Running Touch, the track combines a driving pop melody with the classic Hayden James twist on vocals to deliver a hook that will stick with you.